It took EPFL researchers only three minutes to detect and locate a short circuit triggered intentionally in the power grid serving Fribourg Canton. The researchers, using a computer and a single sensor, spotted it by "going back in time" to find the origin of the problem. Their highly promising method could make it easier to manage complicated power grids, especially those incorporating renewable energies. The tests were carried out on the high-voltage substation serving the city of Cressier in Fribourg Canton. 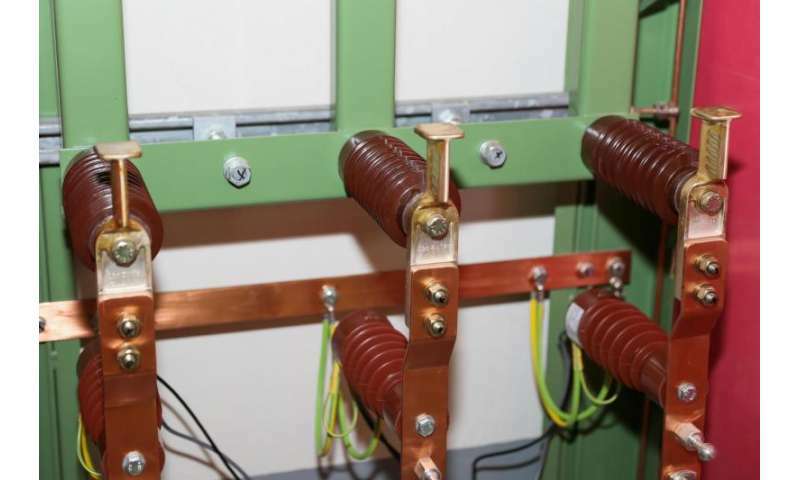 A team of EPFL researchers working inside the substation connected a computer to a sensor that had been installed at a specific point in the grid. Once the connection was established, Groupe E's operators triggered a short circuit, or more specifically a ground fault, in a section containing nearly 12km of power lines. Thanks to their algorithm, the researchers were able to pinpoint the exact spot of the short circuit in less than three minutes and determine which of the line's three phases had been affected. "This was the first time we were able to test our technology on a full-scale power grid composed of both underground cables and overhead lines. Our results are even better than we had hoped for," says Farhad Rachidi, the EPFL scientist co-leading the project with his colleague Mario Paolone. Two factors underlie their method: the scientific phenomenon of time reversal, and the sophisticated equations used to model electromagnetic waves. The process takes place in several steps. First, when the short circuit occurs, an electromagnetic wave is generated along the power lines and spreads throughout the grid. It bounces off other lines from all sides and creates echo waves. When these waves hit the researcher's sensor, the algorithm analyzes them and injects waves going in the opposite direction in a computer simulation of the grid. The simulation reconstructs the waves' pathways until they converge at the point of the original short circuit. "Each echo we receive is a source of information," says Paolone. "As a result, the more complex and heterogeneous a grid is, the better our algorithm works," adds Rachidi. Their highly promising – and now patented – method has sparked the interest of Groupe E and another company, Streamer. Time is of the essence when short circuits occur: they must be resolved immediately to prevent a series of outages and extended blackouts. Power utilities frequently have to send operators out in the field to repair cables damaged by lightning or frost, or to replace faulty components. And these types of grid disturbances occur often – up to once a week on Groupe E's Fribourg grid alone. Several sensors are currently installed at strategic points across the medium-voltage grid. "We can locate a short circuit quickly if we have enough sensors in a grid," says Frédéric Richoz from Groupe E. "Otherwise we have to turn the power off and on in various sections of the grid until we find the damaged spot – but it can take us a while to determine exactly which section of the grid contains the short circuit." 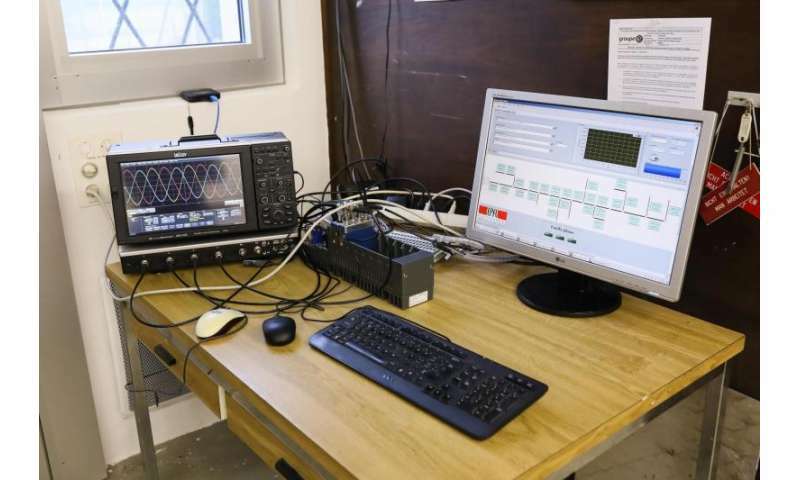 The researchers' system lets operators monitor an entire grid from a single point of measurement. And the more complicated a grid is, the better their system works. That means it's compatible with large grids that incorporate renewable energy. "Our technology would also work in an active-passive grid that includes energy generated by individuals – like solar panels on people's houses. That's something that today's conventional sensors might not be able to do," says Reza Razzaghi, a researcher at EPFL's Distributed Electrical Systems Laboratory. "We are working on improving our algorithm so it can locate short circuits even faster, in just a few seconds," adds Zhaoyang Wang, a PhD student at EPFL's Electromagnetic Compatibility Laboratory.